In May 2018, there were 23 million packages shipped by the USPS that had issues with address quality on the shipping label. Sometimes this inaccurate info is very minor, such as a missing apartment number and the package can still be delivered on time. Other times the incorrect address info can be a major problem, causing a long delay in delivery or even require the package to be sent back to the sender. Most online retailers understand the importance of fast delivery. The “Amazon Effect” has created a whole generation of buyers that expect fast (and free) delivery within 2 days of ordering their product. If there are delays, the customer can become unhappy quickly, which can snowball into negative reviews and the customer never buying from your store again. Plus, an unhappy customer brings additional labor costs for Customer Support and extra shipping costs for those packages that are sent back. Removing any obstacles for fast package delivery is a huge benefit for any online seller. The good news is that Stamps.com can catch these incorrect addresses before your shipping labels are ever printed. Stamps.com matches all label addresses against the USPS Address Matching System, an up-to-date database that verifies all deliverable mailing addresses in the U.S. This process is completed automatically – whether you are manually inputting an address on the “Packages” tab or automatically importing retail orders using one of our ecommerce integrations. The system also adjusts addresses to the preferred USPS addressing standards. For example, if you write “Suite 100” in an address, the Stamps.com address cleansing process will abbreviate “Suite” to “STE”, the preferred USPS format. During address cleansing, Stamps.com will also add the proper ZIP + 4 Code to your address. Avoid delays in package delivery. Get addresses validated automatically by printing all of your USPS shipping labels with Stamps.com. The U.S. Postal Service provides multiple shipping services for international delivery and ships to more than 180 countries. Depending on the service you choose, delivery times vary from 3 days to over 10 days for economical options. As with its domestic offerings, USPS also offers international flat rate options and even provides free shipping supplies for those mail classes. 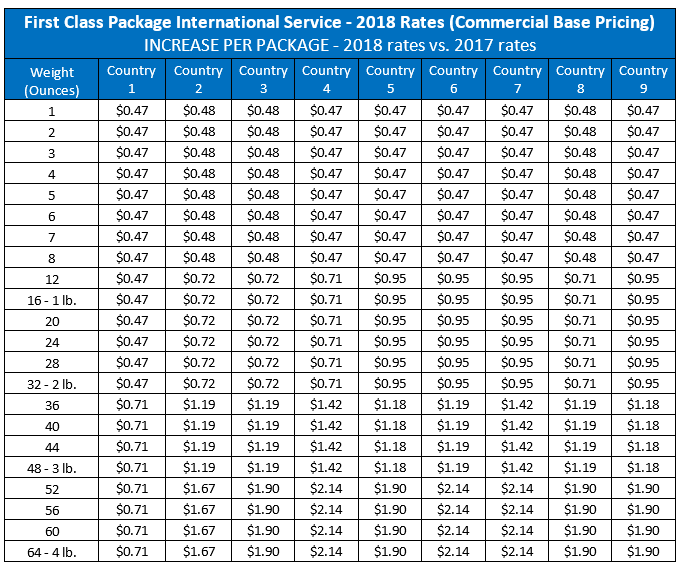 First-Class Package International Service is the USPS’ most affordable international service for the delivery of small packages. The maximum weight for this mail class is four pounds, and delivery time varies by destination. When you purchase First-Class Package International Service online, you’ll save up to 5 percent versus retail rates. Priority Mail International is a cost-effective service that delivers mailpieces and packages weighing up to 70 pounds. This mail class offers international delivery in 6-10 days. When you purchase Priority Mail International online, you can save up to 5 percent versus retail rates. Priority Mail Express International offers date-specific delivery and a money-back guarantee when shipping to select countries, with delivery in 3-5 days. The maximum allowable package weight for Priority Mail Express International is 70 pounds. When you purchase Priority Mail Express International online, you can save up to 5 percent versus retail rates.